I first found out about dear Tony about 5 months ago. Joining his cause has been a life changing experience for me that is hard to describe in words…because when I say life changing, for me personally I mean it changed how I see the world, …how I see people, and how experiencing this kind of hurt and pain in my heart and soul is something that I have never felt before Tony. My love for animals has been something that has been with me as far back as I remember, and I have felt great pain over losing precious animals that have come and gone in my life….but this is a new kind of pain. When you commit yourself to a fight such as Tony’s, and you feel that pain for this animal, you realize that the pain you are feeling , cannot even come close to comparing with what this Endangered Beautiful Tiger has gone through. I have sat here on so many occasions trying to picture one day of Tony’s Life…with the heat, and the noise of all those trucks coming and going…that damn loud noise of all those trucks…the diesel and the fumes they puff out. The crowds around his cage, yelling and poking and prodding, trying to make him move, so they can get a better look…The spotlights on him, when the sun goes down, never giving him some relief from the light…I try to picture one day of Tony’s life. 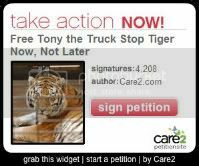 I CANNOT even begin to grasp this over and over for 10 years…..
To anyone that reads this, and has something special in their hearts for Animals like Tony, I ask you to join his fight. We need you all to help us give Tony for the remaining years he has left, a Life that he deserves. A life that has been taken from him. Tony needs YOU to be his VOICE. Tony needs YOU to WIN his FIGHT. Free Tony! he deserve a better life. He deserve a better habitat. 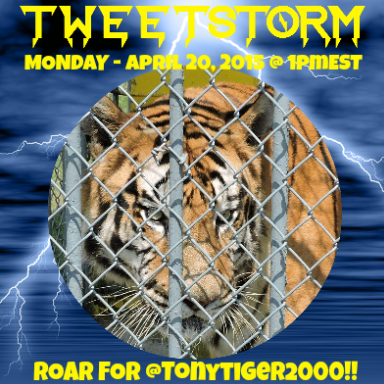 Please, do the right thing and release Tony the Tiger to Big Cat Rescue!!! Tony is a prisoner in that cage and he would be taken care of and have much more room to roam around at Big Cat Rescue!!! A tiny cage is no place for him!!! What a bunch of buffoons the Iberville Parish Council are you can either KEEP exotic pets or you CANT KEEP exotic pets!!!!!!!!!!!!!!!!!!!! 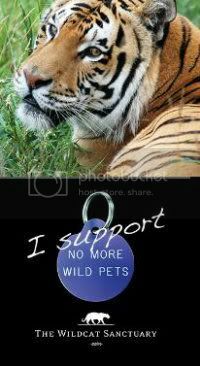 GET REAL you people and let this Tiger go to a proper sanctuary!!!!!!!!!!!!!!!!!!! Please help this Tiger be homed to a Rescue. He is living in discraceful circumstances and looks malnurished. This is no way for any animal to live. He has no way of expressing his natural behaviour. Please, Please help him. 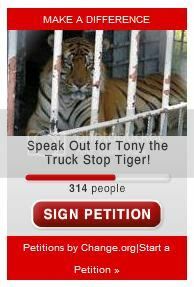 You must let Tony go to Big Cat Rescue. This cage is no place for him to live. Please let him go!!!!!!! Please help get this beautiful animal free! This should not be happening and it’s time to “do the right thing”. Animals can not speak for themselves, so it’s up to us to speak for them. 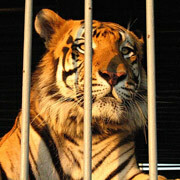 He needs a place where he can roam free, keeping him “LOCKED” in this horrible cage is wrong!!!!!! Please do what you can to get “Tony” out of there!